I am just about to buy the same processor, "Intel Celeron D 320 2.4 GHz Boxed PC533 Socket PGA478, 256KB cache". And I too would like to underclock it, but couldent quite understand how you did it. I have found the right pin in the datasheet "Figure 4-2. Pinout Diagram (Top View—Right Side)"
* what is a good way of isolate it? * what else do i need to do? * how do i do the undervolting you mentioned? I have a linux server at home, that is on 24/7, it broke down during a power failure last friday, so now i have to buy a new mainboard, processor, memory, and a case. and since the server mostly doesent have a GUI, only command prompt, I dont need that mutch cpu power. Before the power failure that crashed my server, i had a Pentium II-400 MHz. So now i hope to underclock it like you did, and that way get less, heat, noise and energy consumption for a server that is on all year. Last edited by _Qwerty_; 18th February, 2005 at 08:27 AM. Ok to underclock you need to short out the 2 BSEL pins (AD5&6) I did this by placing a single strand of wire in the socket between the 2 pins, it's very fidly, I used reverse action tweezers and very good lighting. To undervolt I did the same thing to the VID 3&4 pins (AE1&2) this changes the VID setting from 1.35V to 0.975V which at 1.8ghz is stable and needs very little cooling. If you can fit a large heatsink like the XP-90/120 theres a good chance that case airflow will be enough to cool it though you should make sure that the cpu thermal throttling isn't kicking in, I don't know of any linux tools to check but there is a windows application in the files section called throttle watch which will. 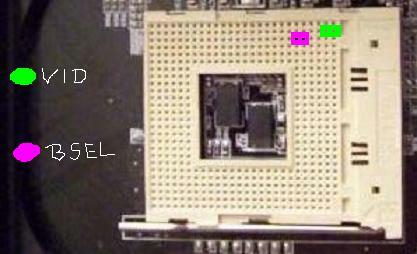 cant you just drop the fsb in the bios instead of messing with the pins? With stock cooling heat doesn't seem to be a problem for me but i do have an open case which probably helps(37 degrees sounds about right and that's at 3.6ghz). it's not so much loud noise as me being a perfectionist and wanting no noise, even the stock intel fan at 5V is too loud for this. You can't hear the system from more than a metre away other than the hardrive and this can't be heard at all when there is a video/music playing, it's quieter than my vhs now. It's very nearly complete and I'll write it up when it is. 37°C also sounds a little cool, I take it thats idle? 37 to 37.5 yeah. Wait actually i just loaded up Sisoft Sandra and ran the CPU and Bios information module and it reports cpu temp at 35.5. I was running a couple programs plus loading that module, that sounds pretty cool eh? damn. Very intresting mod. I also have a Celeron D 2.4GHz and I just tried the voltmod by looping a thin copper wire in an 8 shape around the two pins (I already FSB-underclocked it to 1.8GHz). BIOS health monitor sais it runs on 0.92V now. you don't need to do the figure eight thing really, it works but I decided it was too fidly and so placing a 'u' shaped piece of wire in the socket was much easier. I also took the two ends of the wire and bent them into a U-shape over the side of the cpu so the wire didn't fall off when i turned it over to put it into the socket (which it did twice before). 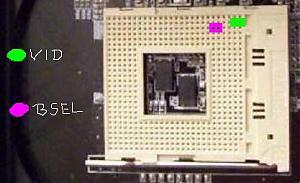 I was hopeing i could do without a CPU-fan, maybe i can if i make an air-channel that connects the PSU air-intake to the cpu-cooler and probalby the mobo chipset too. All of it is suppose to go into a custom box so i think it's doable. Only problem i see is if the PSU fan (which is temp-controlled) runs too slow. I'll just try and see what happens. I wouldn't recomend ducting the cpu heatsink to the psu, that means the psu is only getting hot air to cool already hot components and will ramp up the fan. It's much better to geive the psu cool air and deal with other heat sources seperately, a single exhaust fan ducted to the cpu heatsink and running on a very low speed would be enough and much better than feeding the psu hot air. I know it's not all that great. But if two fans can get quiet enough is the question. I don't wanna be able to hear it at all at 2-3meter distance. I think regardless the air-channel is needed to I cool both cpu and chipset, plus then the fan doesn't go ontop of the cpu-cooler which i think might be too high. I want the box to be as low as possible, so right now the PSU hight is the limit. But doing that will make the psu fan audible I guarantee it, 2 80mm fans running slowly will be quieter than 1 80mm fan running at the speed it will need to to deal with both the psu and cpu. My box is only cooled by the 80mm fan in the psu and a 70mm fan on the cpu which only spins periodically at very very low speeds and the only noise comes from the hard drive which at more than a metre away you don't notice unless you purposely listen for it and can't hear at all over watching the tv or a film, it's only slightly louder than a dvd player. The harddrive problem is solved with the cf-card. Other than the fans the only sound source i can think of will be the dvd-reader (actually a dvd-burner, cause that didn't sound all that much in my desktop). But mostly it's going to play videofiles over the network.